To be eligible for the next REF, Research England’s Open Access Policy requires that journal and conference articles are made Open Access. This policy applies to articles accepted for publication from 1st April 2016. What do I actually need to do?! The quick answer is that to comply with this policy, authors must upload their articles (post-print version) to Pure immediately when they are accepted for publication. (The absolute final deadline imposed by Research England is 3 months from acceptance.) You can either upload publications to Pure yourself (instructions for uploading publications to Pure) or send them to your Faculty Depositor who can upload them for you. The slightly longer answer if you're considering taking the gold (paid for) route, is best explained by looking at the flowchart (see page 2). If you have any questions at all, please contact the Research Outputs team - openaccess@port.ac.uk. How can I find Open Access research? What are the different Open Access policies? What is meant by Green and Gold Open Access? What are the different types of journals? What are the different versions of a journal article? What funding is available for Gold Open Access (APCs) and how do I apply? What APC discount deals (for Gold Open Access) are available to me? How do I upload my publications to Pure? Who is my Faculty Depositor? I'm a Faculty Depositor. Where can I find help? How do I avoid 'predatory' journals? In academic publishing, Open Access means making the entire text of a research output, especially a peer reviewed journal or conference article, readily available online for anyone to access - without financial cost for users, and especially in the case of Gold Open Access, with minimal copyright restrictions on the output’s reuse. Academic publishing in peer reviewed journals typically requires the author of the research to sign a Copyright Transfer Agreement, handing copyright over to the journal publisher. Therefore, because it is the publisher who typically owns the copyright to final published version of a research article, it is the publisher - not the author - who controls the access to its content. But a demand for easier online access to published academic research has initiated the requirement of Open Access to peer reviewed academic research in UK government policy, and also in the policies of many research funders. There are different kinds of Open Access for academic research. In academic publishing, Open Access terminology is therefore typically distinguished between Green and Gold Open Access. Please see the Finding 'good' open access research: a guide for UoP Students and Staff. There are different Open Access policies in the UK, which are broadly aligned in their requirement that journal and conference articles are to be made open access. If your research is produced as a result of funding then more than one policy may apply. To be eligible for the next REF, Research England’s Open Access Policy requires that journal and conference articles are made Open Access. This policy applies to articles accepted for publication from 1st April 2016. 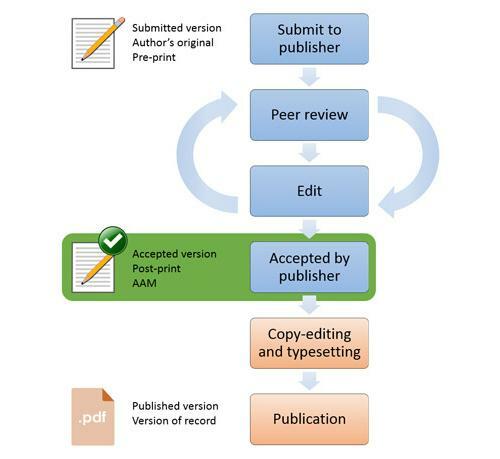 To comply with this policy, authors must upload their articles (post-print version) to Pure immediately when they are accepted for publication. Journal embargo periods must not exceed 12 months for REF Panels A & B, or 24 months for Panels C & D. Research England's Open Access Policy for the post-2014 REF can be downloaded from their website. Please also see their FAQs to this Policy. (Research England was previously called HEFCE and so some documentation may still have the old HEFCE branding). Research England's Open Access requirements apply only to peer reviewed articles published in journals and conference proceedings accepted for publication from the 1st April 2016. Other types of research output - book chapters, monographs, non-article outputs in journals (e.g. a book review or letter), or articles in specialist publications (e.g. a magazine or newspaper) rather than in a journal or proceedings per se - do not require Open Access in order to be eligible for the next REF. However, Research England encourages Open Access on institutional repositories for all research outputs if the publisher's copyright permissions allow it. The University of Portsmouth’s Open Access Publication Policy states that from 1st January 2014 authors are required to add the post-print of all articles published in peer reviewed journals or conference proceedings to the University’s institutional repository (i.e. Pure) immediately upon acceptance for publication. The University’s policy can be downloaded. The University has a preference for the Green route to Open Access, which involves self-archiving the post-print version of the article in institutional repositories (i.e. Pure) - as per the requirements of Research England's Open Access Policy. If your research is externally funded (e.g. by RCUK, the Wellcome Trust, or Horizon 2020) then making your publications Open Access is a requirement of your grant. Please check the terms and conditions of your award, particularly as some funders (e.g. Wellcome, BBSRC, ESRC, MRC) have additional subject-repository and/or data archiving requirements. External funders may also have ‘stricter’ Open Access requirements (e.g. shorter acceptable embargo periods) than Research England. The Sherpa-Romeo website is a useful resource for checking journal embargo periods, and other self-archiving requirements of the publisher. Also, the Sherpa-Juliet website is a useful resource for checking funders’ Open Access policies, and the Sherpa-Fact website shows how the requirements of journal publishers match those of funders. There are two routes to Open Access: Green and Gold. Green Open Access means making the post-print version of your article (accepted post-peer review) available to download and read from your institution’s repository (Pure and the Research Portal). Green Open Access is normally available when a researcher publishes an article in a Subscription (Hybrid) Journal. Such journals normally retain copyright to the final published version of your article. Therefore, publishers of subscription journals typically only allow an article to be made Open Access on an institutional repository on these two conditions: firstly, if it is the accepted post-print version; and secondly, if it is subject to an embargo period. An embargo period is where Open Access is deferred on the repository according to publisher timescales. (However, authors still must upload to Pure immediately upon acceptance). Sherpa-Romeo provides the facility to search for the embargo period, and other self-archiving requirements, of a particular journal. Please be aware that to comply with Research England's Open Access policy, your chosen journal's embargo periods shouldn't exceed 12 months for REF Panels A and B, or 24 months for Panels C and D.
Gold Open Access means making the published version of your article (formatted according to the publisher’s formatting) available to download and read from the journal’s website immediately on publication. This typically involves the payment of an Article Processing Charge (APC) by the university where an individual author works to the publisher. Gold Open Access occurs when a researcher publishes an article in either an Open Access Journal or a Hybrid Journal (read about the types of journal). On payment of the APC, the journal publishers apply a licence that enables the free re-use of the article, such as the Creative Commons CC-BY licence. Among other things, a Creative Commons licence allows academic researchers to self-archive the published version of their article in their institutional repository, i.e. Pure. Please note that if you take the Gold Open Access route then you still must upload your publication to Pure. The main condition is that an attribution is made to the article in its original location of publication in the journal. These two routes into Open Access are related to the different types of journals that exist in academic publishing. Journal publishers typically operate under two different business models: Subscription Journals and Open Access Journals. Subscription (Hybrid) Journals - The business model of a Subscription Journal involves the payment of a subscription fee by university libraries to access articles. The default position is that a Subscription Journal is therefore free of charge for an individual author to publish in. This is the traditional model of publishing. Open Access can be archived by publishing in a subscription journal by following the green route. This means that the author uploads a copy of the article (typically the post-print version) to their institutional repository (e.g. Pure) as soon as it's accepted for publication. The article then becomes Open Access after an embargo period specified by the publisher. However, most major publishers of subscription journals now also offer an author's university the option of paying an Article Processing Charge (APC). This allows the article to be made Open Access via the gold route, i.e. it's Open Access immediately on the publisher's own website. Therefore, while Subscription Journals charge organisations / people to access their content, some specific articles are actually free to access. Open Access Journals - The business model of an Open Access Journal involves always charging to publish. However, the full content of Open Access journals can, as their name suggests, be accessed without charge by anyone in the world. To publish in an Open Access journal, the author's university always has to pay an Article Processing Charge (APC). This allows the article to be made Open Access via the gold route, i.e. it's Open Access immediately on the publisher's own website. Universities have to adopt the terminology that publishers use for the different versions that an article goes through before it is published. Sometimes this terminology is far from intuitive! The pre-print is any draft version of the output before peer-review. Pre-prints do not comply with either Research England's, the University's or RCUK's OA policies. This version is sometimes referred to as a 'draft' or 'submitted' version. The post-print is the author’s accepted and final peer-reviewed text. This is the version accepted by the publisher after the peer-review changes have been made, but it does not typically include the publication-specific formatting. The Open Access policies of the University, Research England and most major funders accept this version. This version is sometimes also referred to as the author's final draft, accepted author manuscript (AAM) or the author's final peer-reviewed manuscript. Example. The publisher's version is the final published version. This is after peer-review and with the publisher's formatting. All OA policies accept this version, however, publishers typically do not allow it to be made Open Access unless an Article Processing Charge has been paid. This version is sometimes also referred to as the publisher's version of record. Example. Gold Open Access is when an author publishes in either an Open Access or Subscription (Hybrid) journal and pays an Article Processing Charge (APC) in order to make the article openly available (without charge or subscription) immediately on the journal’s website. To apply for APC funding please complete the APC funding application form. The University recognises the growth in Open Access publishing and in funder requirements for Open Access, in particular RCUK policy. In accordance with the University’s Open Access Publication Policy, the preferred choice of route to Open Access is by making the ‘post-print’ of a published article accessible after a journal-defined embargo period (6-24 months) has elapsed through the Institutional Repository - Pure (i.e. the ‘free’ Green route to Ope Access). However, the University recognises that in some cases articles may be made Open Access immediately on publication by the payment of Article Processing Charges (APCs) – the Gold route Open Access. The University therefore a small APC budget to which academics can apply. (i) Research funded by RCUK. (ii) Research funded by other, non-RCUK, funding bodies, giving priority to high quality articles likely to be considered for Research Excellence Framework (REF) submissions. (iii) Research that is not funded by a competitively awarded external research grant, providing that articles are of significantly high quality and that there is a clear benefit to the University from immediate Open Access publishing, e.g. the article is likely to be considered for REF. This budget cannot be used to pay for general publishing charges, such as colour and page charges. Before submission - If you wish to take the gold route to Open Access, before submitting your article to a journal for publication you must secure funding to pay for the APC. To be eligible to apply for APC funding from the University’s central funds you must be the corresponding / communicating author on the article. You can either be an academic member of staff, a PhD student, a post-doctoral researcher or a post-graduate researcher. In the case of the latter 3, your University of Portsmouth supervisor must be a co-author. With regards to co-authored articles with colleagues from other institutions, the expectation (of the sector) is that the lead/corresponding author’s institution will responsible for any APC fees. You are strongly advised to apply (and to wait to receive a response) before you submit your article to the journal or conference. If the application is made at a later date, acceptance by the journal or conference will not guarantee that APC funds will be made available. Your article must be for a peer-reviewed journal or conference proceedings. The University has a separate budget for APCs for RCUK funded authors. For authors without RCUK funding, the University’s APC funds are only available to authors who can demonstrate that they have no other sources (e.g. their departments) from which they can meet the costs, and that paying an APC to publish in the specified journal can be justified. Matched funding from a Faculty/Department/Research Centre or PI project account will be considered favourably. The University also has a number of APC discount deals which you are encouraged to take advantage of. Once you have submitted your application, your request will be assessed by both your Unit of Assessment coordinator and Associate Dean for Research (ADR). In the case of RCUK funded research, your application will only be assessed by your ADR. The Research Outputs team in the Library manage this process and will inform you if your application has been successful or not. Upon acceptance - Providing that your application for APC funding (above) was successful, once your article has been accepted for publication by the journal or conference you need to email a copy of the invoice to openaccess@port.ac.uk and we will arrange for it to be paid. You must also upload the post-print to Pure immediately to ensure that the requirements of Research England's Open Access Policy are met. After publication - Publishers usually allow you to replace the post-print with the publisher’s version in Pure when the article is published, as paying for Gold Open Access should mean that your article comes with an Open Access licence, such as Creative Commons, e.g. CC-BY. Appeals - Appeals on outcome decisions for APC funding may be made to the Pro Vice Chancellor for Research via openaccess@port.ac.uk. What APC (gold Open Access) discount deals are available to me? If you are considering going down the route of Gold Open Access then you should take a look a the discount deals that are available to you. discount deals currently available. Please also follow the process for applying for APC funding if required. Creative Commons licences (e.g. CC-BY) are one of the primary types of public copyright licences used when publishing via the Gold Open Access route. For information about the different kinds of Creative Commons licences please see the Library's copyright guidelines page. How do I upload a publication / research output to Pure? Instructions for uploading publications / outputs to Pure. Categories of where research publications / outputs go in Pure. Creating 'linked outputs' for the REF to be submitted as single submissions (aimed at CCI academics). Alternatively, instead of uploading your publications to Pure yourself, you can email them to your Faculty Depositors and they can upload them for you. Your Faculty Depositor is someone who can upload publications to Pure on the behalf of researchers. Here is the help guide for Faculty Depositors. Please contact openaccess@port.ac.uk if you have any questions. Pure is a current research information system (CRIS), which is used to address many of the University's information and reporting requirements relating to research activities. In addition to research outputs and associated metadata, Pure can also store information about research staff (profiles), projects, finance, activities, press coverage, impact, datasets and much more. Read more about Pure and the Portsmouth Research Portal. 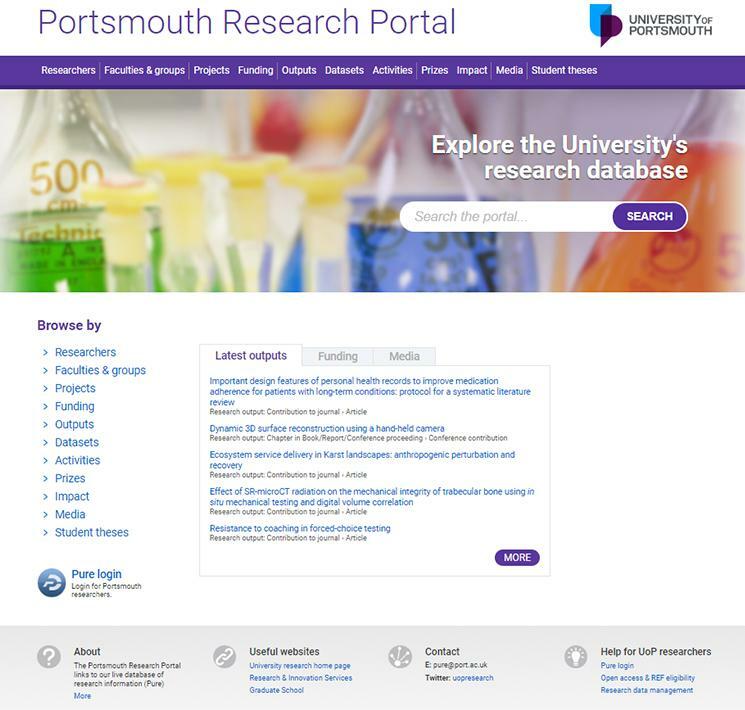 What is the Portsmouth Research Portal? Portsmouth Research Portal is a public website showcasing University of Portsmouth research personnel, our research projects, outputs and outcomes. 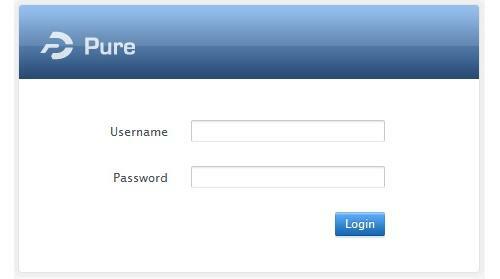 It provides a publicly accessible, fully searchable and navigable interface, with information drawn directly from Pure. Read more about Pure and the Portsmouth Research Portal. An unfortunate side-effect of the growth of high-quality open access journals is the number of 'predatory' open access publishers that have also sprung up. These publishers essentially accept as many articles as possible in order to make as much money as possible. Find out more. Image credit - Open Access photograph above - used under the CC-BY-SA licence.